Spicy Thai Shrimp Salad Recipe is a light, delicious, and refreshing meal full of spicy sweet Thai shrimp flavors! 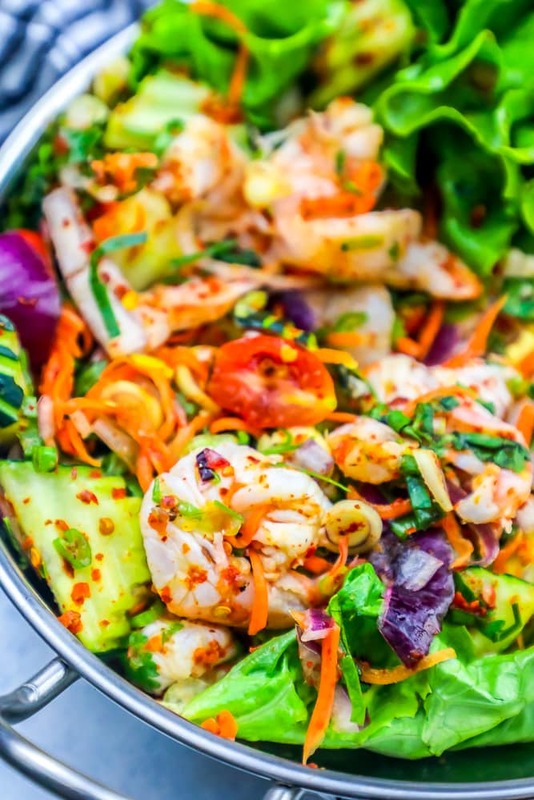 Great for picnics, parties, or a busy lunch or weeknight – for a delicious spicy sweet low calorie salad that is bursting with delicious Thai shrimp salad flavor! 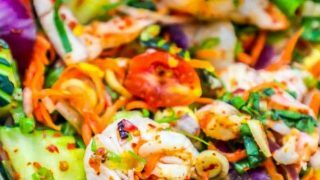 If you love delicious, easy, and filling salads, this low calorie, super easy Spicy Thai Shrimp Salad recipe is going to knock your socks off. It is super simple, is completely no-cook, and is easy to simply toss and chill before serving. This shrimp salad is light and refreshing and perfect for a hot summer day’s lunch – but is packed with protein from shrimp and nuts, so it is hearty enough to eat when it’s cool out. This chilled shrimp salad is perfect on the go – you can simply keep it in a jar in the fridge and toss with lettuce when it’s time to eat, and indulge in a delicious restaurant quality Spicy Thai Shrimp Salad anytime you’d ready for a deliciously sweet and spicy shrimp meal! This spicy shrimp salad is sweet and has amazingly delicious flavors and a fabulous texture – with crisp vegetables and crunchy peanuts that make this salad one your whole family will love. If you’re worried about how spicy this salad is, don’t worry too much – you can easily adjust the heat by adding in less red pepper flakes according to your tastes. 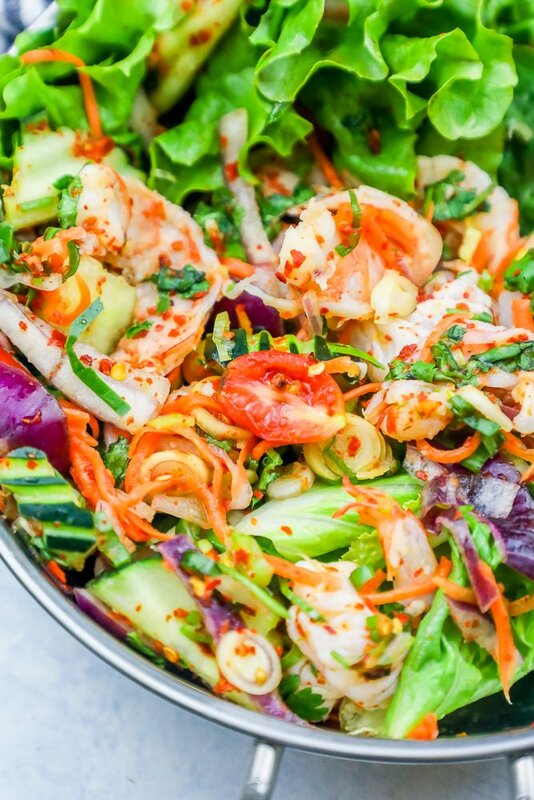 JUST TAKE ME TO THE SPICY THAI SHRIMP SALAD RECIPE ALREADY! If you’d rather skip my (very helpful, i think) tips and tricks, essential cooking info, and similar recipe ideas – and get straight to this deliciously easy shrimp salad recipe – simply scroll to the bottom of the page where you can find the printable recipe card. This delicious and easy shrimp salad is the perfect easy meal – just toss, chill, and eat – but there are some tips to make sure your spicy shrimp salad is fresh, delicious, and bursting with spicy sweet Thai Shrimp flavors that your whole family will love! 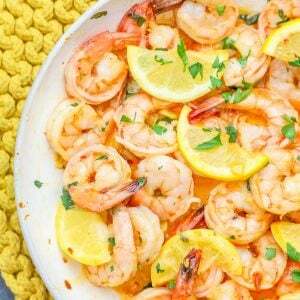 Let your shrimp marinate in the dressing for at least an hour before serving. Letting your shrimp sit in the dressing will help soak up all the delicious flavors and help your dressing come together. Don’t dress lettuce until you’re going to eat. Dressing your lettuce shouldn’t happen until you’re ready to eat (unlike the other vegetables and the shrimp) because it will wilt and get super soggy. For food safety’s sake, keep your dish chilled the entire time. If you don’t love the vegetables I’m adding to this spicy shrimp salad, change them up and pick vegetables you love. Try sugar peas, zucchini, onions – whatever you have on hand or love! 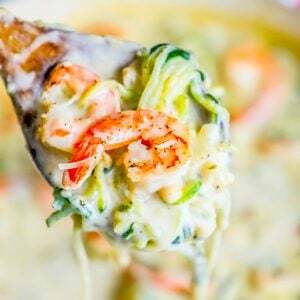 Shrimp is one of my all time favorite seafood ingredients – whether it’s in this deliciously spicy Thai shrimp salad, in a creamy shrimp alfredo, or simply sautéed with some butter and garlic. 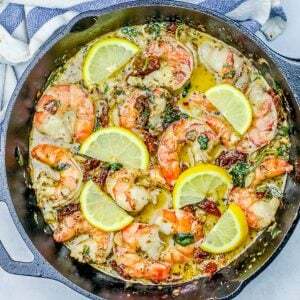 The recipes below are delicious, easy, and quick shrimp meals your whole family will love. 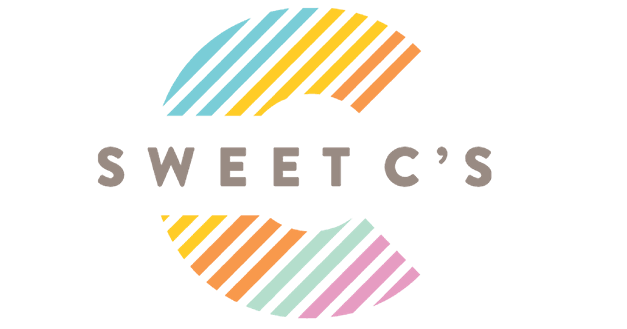 Simply click to open to find each easy printable recipe! This delicious cold shrimp salad is seriously one of the easiest recipes ever – you don’t need any special equipment to make a delicious restaurant quality Thai Shrimp dinner. Since we’re making the sweet and spicy Thai shrimp dressing and letting it marinate, you’ll need a bowl that is easy to mix the dressing in and stir well to dissolve the sugar to create an addictive layered flavor. 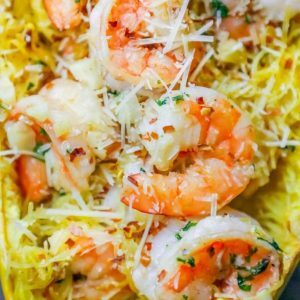 This recipe doesn’t require any cooking whatsoever – you’ll need chilled pre-cooked shrimp that have been peeled and de-veined. To make the most delicious salad, I prefer very very thinly sliced vegetables – think coleslaw sized strips instead of chunks. This will give your salad more surface area for the deliciously addictive dressing to stick to! You’re going to need to stir or whisk the dressing to get it to come together. Since we’re going to chill the shrimp salad for about an hour before serving, letting the flavors come together beautifully, it’s important to keep the dish chilled in an airtight container or under plastic wrap to prevent contamination, oxidation, or taking on funky fridge flavors. If you love this Spicy Thai Shrimp Salad Recipe as much as I do, please write a five star review, and be sure to help me share on facebook and pinterest! 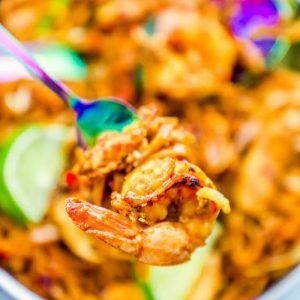 Spicy Thai Shrimp Salad Recipe is a light, delicious, and refreshing meal full of spicy sweet Thai shrimp flavors! 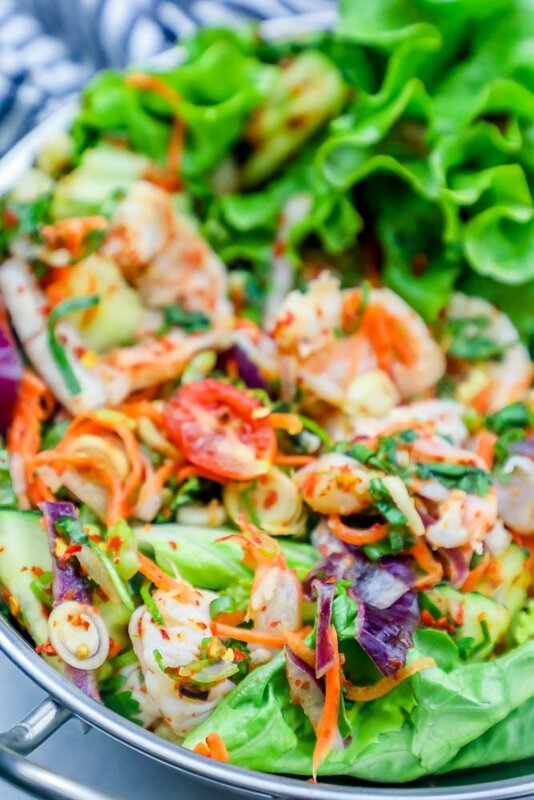 Great for picnics, parties, or a busy lunch or weeknight - for a delicious spicy sweet low calorie salad that is bursting with delicious Thai shrimp salad flavor! In a small bowl, combine fish sauce, oil, lime juice, sugar, and bell pepper and mix well until combined and sugar is dissolved. 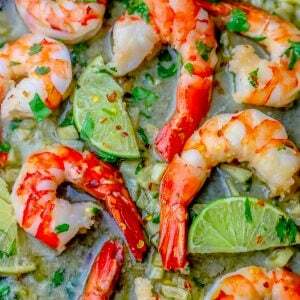 In a large bowl, add shrimp, herbs, and vegetables and drizzle sauce over. Toss well and chill, covered, for at least 1 hour and up to overnight. Add lettuce to a bowl and toss shrimp and vegetables over the top.